Think outside the box and solve the puzzles in Blackbox. 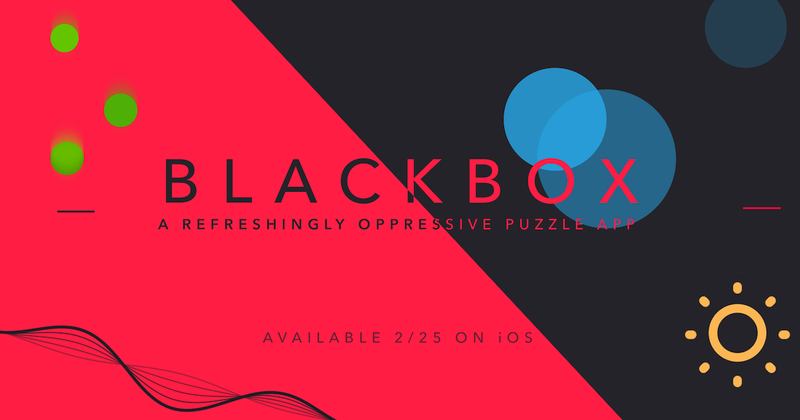 Blackbox is an iOS game that requires you to complete very specific tasks to solve its mind boggling puzzles. Players have been scouring the internet for solutions to some of the more obscure challenges and if you’re one of those people, we’re here to help! Below, you’ll find the steps you’ll need to take in order to clear all the levels. Make note that puzzles with more boxes don't necessarily require you to execute the steps we've listed below in any particular order. Just know that we've outlined the instructions in a way that will make beating this game easy for everyone to do. Here are a few important tips before we begin. When exploring potential solutions for puzzles, the color of the box can be a big clue. This is because squares of a similar hue may require similar tactics to solve them. It's important to be observant with this game because a simple image or permission request to a particular feature on your phone can provide insight on a possible solution. Remember - you have to think outside the box! If you're looking for easy, then taking on the punishing challenges of Blackbox might not be for you. There are many puzzles in this game that demand time, patience, and travel! If you're prepared to give it all and try your best, then feel free to continue reading. Rotate your phone until all 4 squares around the edge have been triggered. Place your phone face up on a flat surface so that both circles meet in the middle. Place your phone face down on a flat surface so that both circles meet in the middle. Turn the brightness all the way up. Turn the volume all the way down. Hold your phone up to your ear for 10 seconds as if you’re making a call. Set your phone on Airplane mode and turn off your WiFi. Use the screenshot feature on your phone. Leave the Blackbox app running in the background and open it up to this Puzzle once every hour for 24 hours. Plug in your charging cable when the green balls first fill the screen. Charge your phone battery all the way up to 100%. Get your phone battery to drop to 10%. Muffle the mic to keep it from picking up sound. Yell into the mic loudly. Say “Hey, Blackbox!” clearly into your mic. Change the date to a day of the full moon. Change the date to a day of a new moon. Place phone face up on a flat surface until the color fills the screen completely. Open the app to this Puzzle during sunrise. Open the app to this Puzzle during noon time. Open the app to this Puzzle during sunset. * You can find the exact times for these occasions on Google and skip for this Blackbox Puzzle by manually setting the time on your phone to each. Travel far enough to fill the first 3 rings. Travel to a high enough altitude to fill the last ring. * Many Blackbox players have had difficulty completing this Puzzle because it is very demanding. Tap your phone’s screen repeatedly in different places to unlock the secret meta challenge! Use a finger that is NOT currently registered for touch ID 3 times in a row. Move app to the bottom-left of your home page and open it. Shake your phone and press undo when the app prompts you. To turn on the green box, turn off the Set Automatically option under Date & Time in your phone’s settings. Manually set the current time back by one minute. Open the app back up and the green box will be turned on. Turn it back on and the hot pink box will be turned on. Congrats puzzle solving extraordinaire! You are well on your way to unraveling the mysteries of Blackbox. You can find the answers to the Erudite Pack on the next page. Please let us know if you want to know how to solve a particular Blackbox puzzle or if you're looking for a more specific set of instructions for a certain box.